REPORTS: Thibaut Courtois offered a pay rise. Joe Hart eyed as a potential replacement. The future of Thibaut Courtois remains under scrutiny with Real Madrid waiting in the wings to approach the 24 year-old Belgian Goalkeeper in the summer. As a result Joe Hart is being lined up as a potential replacement. That's what reports in the press and the media would have you believe if you make reading the tabloids part of your daily ritual. Now I have had my say on the reports on the Blog last week (check it out here if you missed it) but it does not seem to be as cut and dried as people think according to this report featured in The Telegraph. As we all know Chelsea are on a current record breaking run of twelve wins in a row with Stoke to follow tomorrow and a chance to equal Arsenal's record of thirteen games in the top flight. 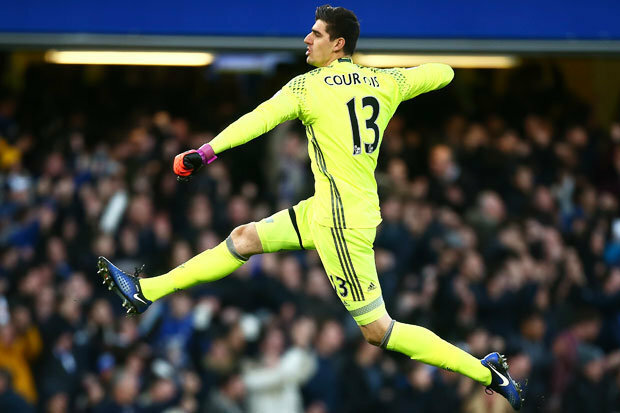 During that twelve game period, Thibaut Courtois has kept ten clean sheets and has only conceded two goals which is a fantastic record. Our defence must take plenty of credit for their role in our current run but when called upon, Courtois has been exceptional with his two important saves against Bournemouth the perfect example. It appears that Chelsea are determined to hang on to the Belgian Goalkeeper by offering him a 50% pay rise to reportedly take him to £150,000 per week to extend his contract here and by all accounts he is happy to do so which would be a blow to Real Madrid. The change to the Goalkeeping Coach seems to have made a difference this season with the departure of Christophe Lollichon and arrival of Gianluca Spinelli as we have seen in the player himself. He looks much more settled and focused this season and so far, the mistakes made last season seem to be a thing of the past. We hope that Courtois will sign an extension to his current contract and stay here at Chelsea. If he doesn't then according to various reports in the media including this report as featured in The Mirror, Chelsea have an eye on Joe Hart who is currently out on loan at Torino having fallen out of favour at Manchester City with Pep Guardiola. With a potential fee of £10m being touted for Hart it comes as no surprise that Liverpool are also linked with a move for the England Goalkeeper as they look to solve the problems they currently have at Anfield. Expect more to follow on Courtois' new deal and on Joe Hart as the season continues.